Nebraska voters would be asked if they want to let 18-year -olds serve as legislators, Supreme Court judges and the governor under a proposal being debated in the Legislature. 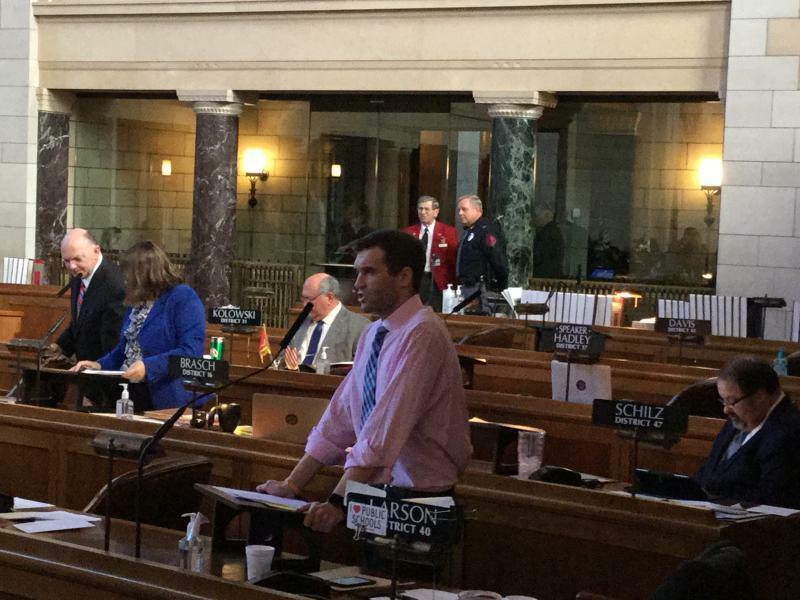 Right now, you have to be at least 21 to serve in the Nebraska Legislature, and 30 to serve as governor or as a judge on the Supreme Court. But under a constitutional amendment proposed by Sen. Tyson Larson of O’Neill, the minimum age would be lowered to the federal voting age, currently 18. The proposal drew immediate opposition from Sen. Dave Bloomfield of Hoskins. “I can’t support this. For Pete’s sake, if we elected an 18 year-old governor, he wouldn’t be able to buy a beer to celebrate,” Bloomfield said. Sen. Mike Groene of North Platte disputed that reasoning. “Yes, there are soldiers 18 years old. But there are not 18-year-old captains or sergeants or lieutenants,” Groene said. If he were 18, Groene said, he would not want 18-year-old sending him into battle, adding that there is a similar difference between allowing 18-year-olds to vote, and allowing them to hold positions of power. Sen. Ernie Chambers of Omaha said 18 is too young an age limit for office-holding. “If you’ve got an 18-year-old child, you wouldn’t turn that 18-year-old child loose to manage all the affairs of the family. You wouldn’t do it. And it’s no disrespect toward the child, or denigration of the child. We just know better,” Chambers said. An attempt to postpone further consideration of the proposal until the end of the year, effectively killing it, was defeated 28-5. Senators then adjourned for the day without reaching a first-round vote on the proposal. If they do eventually approve it, it would appear before Nebraska voters on the November ballot. In other action Thursday, lawmakers gave first round approval to a bill by Chambers that would create specialty license plates promoting the conservation of mountain lions. Chambers has long opposed allowing hunting mountain lions, which is still allowed by state law, even though the Game and Parks Commission has said the population is not large enough to allow a hunting season this year. Chambers said his license plate bill reflects widespread interest in the subject. “I’ve been told by any number of people that they would purchase these plates. There is a tremendous amount of support for conserving the small population of mountain lions which we have in this state,” he said. The plates would cost an additional $5 above the regular charge for alpha-numeric plates, and an additional $40 for personalized plates, with proceeds to go to a fund to promote conservation education for young people. Senators gave the bill first-round approval on a vote of 38-0. Editor’s note: The Legislature is in recess Friday and will reconvene Monday.